With number one son away at camp for a month, my evenings have been especially quiet. While my husband pours over finance textbooks like he’s cramming for an exam (when in fact it’s just his idea of leisure reading), I’ve been averaging three to four books a week myself. This week I’ve read some good and some not-so-exciting books. 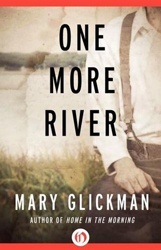 My favorite by a longshot has been Mary Glickman’s novel, One More River (Open Road, 2011). Set mainly in Mississippi in the 1960s, it tells the story of Bernard Levy and his son Mickey Moe. Bernard is killed in combat during WWII when Mickey Moe is a young lad. Some twenty years later, Mickey Moe attends a Jewish singles tea arranged by some parents so their young adult children can meet other Jews of good standing. Or as they say in the South, of good blood. There he meets Laura Anne Needleman and it’s love at first sight for both. In the early 1960s, the women’s rights movement is just starting to brew, and civil rights is a bit in front of that. For Laura Anne, marriage to Mickey Moe Levy isn’t just about committing the rest of her life to a kind man with striking looks. It’s also a symbol of independence. Rumor has it that Mickey Moe’s late father was a con man and perhaps a murderer. Laura Anne’s parents would never approve such a marriage, but their daughter has other ideas. Mickey Moe and Laura Anne find themselves on a long-distance search to uncover Bernard Levy’s past. And when they learn the truth, it’s something they aren’t prepared to share with the Needlemans. One More River is a unique look at Jews in 1920s-1960s Mississippi and Tennessee. But more than that, it’s a touching love story that brought more than a few tears. Mary Glickman herself has an interesting past. Born and raised Catholic, she found Judaism as an adult. After she converted, she and her husband discovered the South. Now Mary has published a couple novels about Jews in the South and is working on another. She’ll be touring Chicago this autumn! Thanks, Susan! I just added it to my to read list on Good Reads. Thanks so much! I hope you like it! !